With the blazing red lights and the resonating electric guitar riffs paired with the song, the audience was swept into a state of excitement which set the mood for the rest of the show. 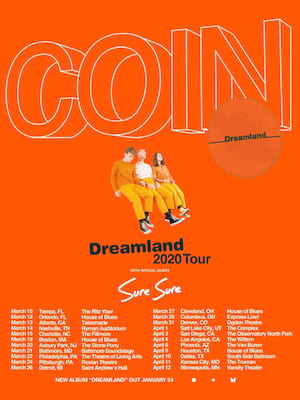 The city of Nashville, Tennessee is synonymous with the stomping stetson anthems of Country music's brightest lights, but indie rockers COIN are breaking the mould of their home city and producing bright-eyed, upbeat pop more commonly associated with the LA, NYC and London scenes. Catch recently released singles 'Simple Romance' and 'Cemetery' live as the band hits the road on a North American headline tour, in support of their forthcoming album which is set for release later next year! Fusing fuzz-laden guitar riffs with pop mega hooks and driving, pounding drums, the band call to mind a rock-edged 1975, often taking the time to jam and improvise. Known for their high-energy, electric live shows, the outfit's frontman Chase Lawrence regularly jumps into the crowd to spread the band's infectious buzz. Don't miss these stars-in-waiting as they rise to bigger things. Sound good to you? 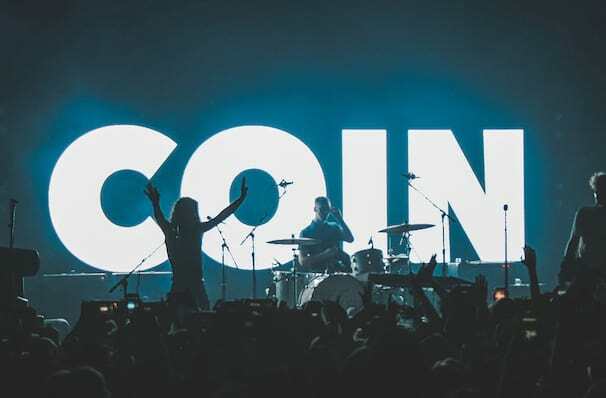 Share this page on social media and let your friends know about COIN at The Depot. Please note: The term The Depot and/or COIN as well as all associated graphics, logos, and/or other trademarks, tradenames or copyrights are the property of the The Depot and/or COIN and are used herein for factual descriptive purposes only. We are in no way associated with or authorized by the The Depot and/or COIN and neither that entity nor any of its affiliates have licensed or endorsed us to sell tickets, goods and or services in conjunction with their events.